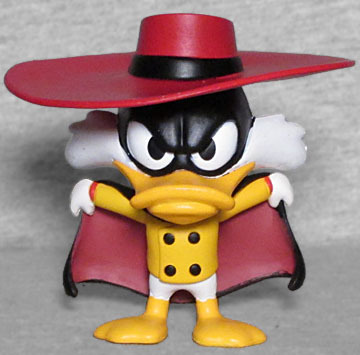 Every hero needs villains, and just like his noctillionine inspiration, Darkwing has some great ones. 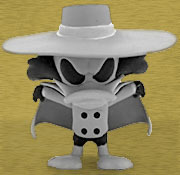 (In fact, long before this "Disney Afternoon" set of Mystery Minis was announced, we tried to convince Funko to do a full Darkwing Duck series, featuring him and all his most notorious baddies. No luck.) The top of the heap - though still Public Enemy #2 in St. Canard behind Dr. Slug - has to be Negaduck. Negaduck is that finest of comic tropes, the evil clone from a mirror universe. Fittingly, he uses the same mold as the Darkwing figure, just done in brighter colors: yellow jacket, red hat, black cape with red lining. Darkwing dresses darkly because he wants to blend into the shadows, Negaduck dresses brightly so you can see him when he's about to kill you with a chainsaw. That's not a joke, by the way - the villain on this comedic Disney cartoon that aired at 4 in the afternoon enjoys attacking people with chainsaws. Though he's the most famous character to use the name, that wasn't the first Negaduck. The original showed up when Darkwing was shot by a "tronsplitter" that could divide its target into two halves, one made purely from positrons and the other made from negatrons; so he became both Posiduck and Negaduck, with the only difference being that Negaduck had big eyebrows; then, when Negaduck got shot again, he became galvanized and supercharged, turning into a glowing black-and-white version. And again, same mold. The grayscale Negaduck is a Hot Topic exclusive, available in a 1:6 ratio, while the Negaduck anyone would want was available at the same rate at Toys Я Us.